D&T provides a wide range of touch sensing technologies for integration into your display. Each technology has its own unique benefits and limitations. Read below for a general overview, or contact us for more detailed information on the sensing technologies we can provide. A series of horizontal/vertical transmitters and receivers create an invisible mesh of IR light above the screen's surface. As a touch input is introduced, a particular coordinate in the array of light is blocked. The location is then communicated to the controlling device. Detects 20 touch points to support multi-users, complex written inputs and multi-touch gestures. Detects touch inputs from any solid object. Cost competitive, reliable, and easy to maintain. Plug-n-play compatible with all OS as an HID input.  A transparent conductive film is laminated to the inside of the display's cover glass. A mesh of horizontal and vertical channels are embedded in the film. When a touch input is made, the electrical charge at point of contact is changed. The sensor registers this point of "capacitance" as the touch point and communicates it to the controlling device. Supports up to 100 touch points. Touch resolution is higher than other technologies, prevents touch occlusion and allows for more precise and detailed inputs. Additional electrostatic pen technology supports detailed writing inputs. Palm rejection is supported and touch input size detection is possible. Not susceptible to light interference. Electromagnetic Resonance sensors detect touch by measuring the magnetic charge between an antenna board embedded in the display and a specialized pen controlled by the user. Pen supports pressure and tilt recognition. Programmable button functions as a click, eraser, or shortcut of your choice. No need to pair the pen through a dongle, RF, or Bluetooth connection. Pen supports hover. See your point of contact before you touch the screen. Sensor is embedded in the screen, not susceptible to light interference.